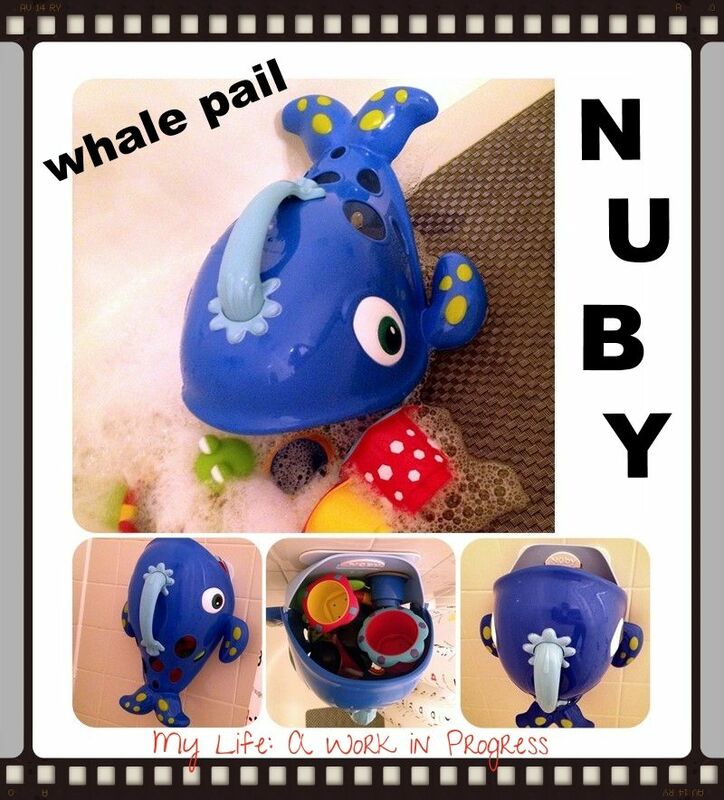 Nûby recently unveiled their new bath line, and these toys are cute! My favorite so far is the Sea Scooper. Okay, it’s not exactly a toy, but from a mom’s perspective, it sure is handy! This BPA-free bath toy scooper makes cleaning fun, quick, and easy after bath time is over. 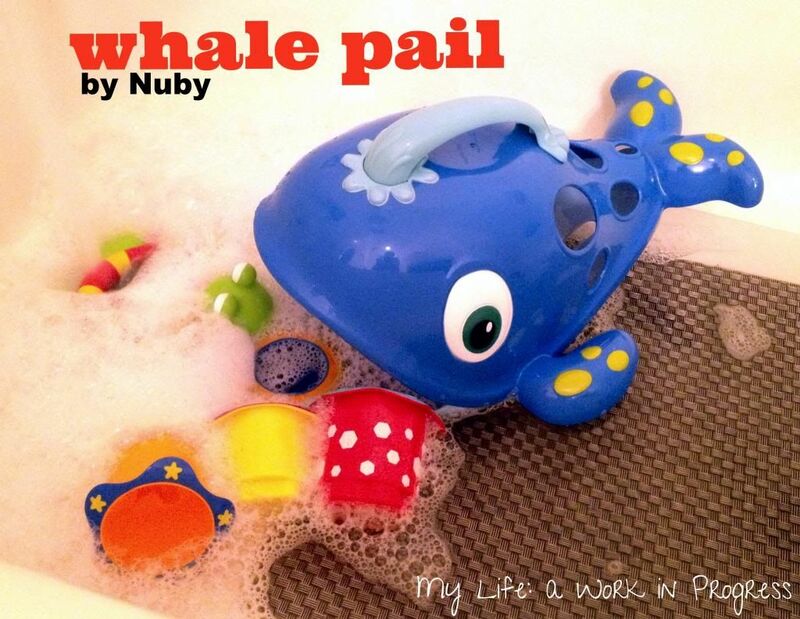 Grab the handle and scoop up your baby’s toys into the whale’s tummy, entertaining your baby in the process! The built-in drain holes allow excess water to drain away from the toys and out of the pail. Use the easily installed wall hook to hang your scooper and toys out of the way until the next bath time. It’s great! Before the sea scooper, I just left Baby J’s toys in the bottom of the tub. He’s the only one that uses that bathroom unless we have guests. But when people stay with us, I gather them up and find a place to stick them. This is much better! I actually place the scooper into the tub during bath time, because he likes to play with it. The hook was easy to install. After I first stuck it to the shower wall, I waited about an hour before placing the sea scooper on the hook. It stayed and has never fallen. As reference, all of our bath toys fit inside of the scooper: the Nûby stacking cups, Nûby tub time turtle, a couple of rubber duckies, and some little bath squirters. There’s still space to add more. 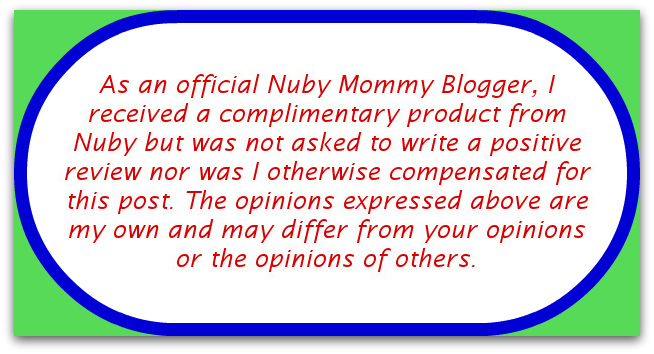 Nûby’s Sea Scooper is available from several retailers, including: Buy Baby Direct, Buy Buy Baby, Bed Bath and Beyond, Amazon, and Bealls. Prices vary, so make sure you shop around. For updates on new Nûby products, follow them on their social media accounts (listed below). They always have great giveaways going on and other fun stuff! This is super cute! I think it would make a great baby gift too, full of wash cloths and baby soap! These are cute. My kids would love this as they love bubble bath these days. This Whale looks so cute 😀 Great review! That’s nice I like that a lot. Very good ideal, those toys can really stack up. Oh that’s so cool, what a neat idea. This would come in handy! Love this so much! Cannot wait to get one :). That is SO cute! I need one of these! This is so cute! We put ours in a bucket and I don’t think they drain well there. Love it! That would go perfectly with my kids’ “under the sea” themed bathroom! Love that it is so cute it makes it fun for the kids to help pick up their bath toys! This is so cute. I would love to have this! I love that the scooper allows bath time to be fun yet also gets kids to be enthusiastic about cleanup. And it’s BPA free! The amount of tub toys my son has is seriously ridiculous. This would be awesome! Right now his toys all just kind of sit around the tub. So much for a relaxing candle lit bath- there’s no room for my candles anymore! What a cute way to contain toys in the tub! My favorite thing about this pail is the holes that allow the excess water to drain. Definitely a must to keep toys dry and organized. This would be a nice addition to the boys bathroom. Very cute! i love how it hangs on the wall and drains the water out.